Mixed pastel flowers convey a variety of sentiments. 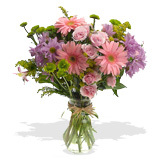 A pastel mixed flower bouquet is a lovely friendship bouquet, and they are the perfect bouquet if you would like to make a nice gesture to a friend. Pastel mixed flowers are ideal on their own, or in a mixed flower arrangement, whatever you chose they will no doubt touch the heart of the recipient. Arranging Pastel Mixed Flowers: FlowerFresh is dedicated in providing you premier quality fresh flowers direct from the source. We select our flowers, from the farms that specialize in a particular flower type, to ensure you get the highest quality freshest flowers that will last longer and look better. Prior to arranging your fresh flowers remove the foliage below the water line and trim the stems 1-2 inches. All your fresh flower bouquets come preset in variety of pastel colors and floral design styles ready to be dropped in the vase for maximum aesthetic appeal. However for you creative types, feel free to play around with flowers and mix them in a way that appeals to your sense of style, creating the prefect fresh flower bouquet for your home. Pastel Mixed Bouquet Care Tips: A little extra care can make a big difference in maximizing the vase life of your pastel fresh flower bouquet. The following care tips should be followed with all the mixed flower bouquet you receive. Cut the bottom of the flower stems 1-2 inches, diagonally under running water, using a sharp knife or scissors. Remove all the leaves that fall below the water line. These leaves breakdown and decay, which promotes bacterial growth, which can block the flower stem and stop the flowers taking up the water. Arrange your mixed flower bouquet in a vase with lukewarm water mixed with the first packet of floral food. This will help the closed flower buds to start opening and help to prolong the life and beauty of your fresh flower bouquet. Place your flower bouquet in a cool location away from direct sunlight, electrical appliances and drafts. Top up the vase regularly with fresh water, re-cutting the flower stems when necessary. This helps to prolong the life and vibrancy of your fresh flower bouquet.